Dehydrated patients don't have enough fluid (water) in their blood to get nutrition and oxygen to their tissues. 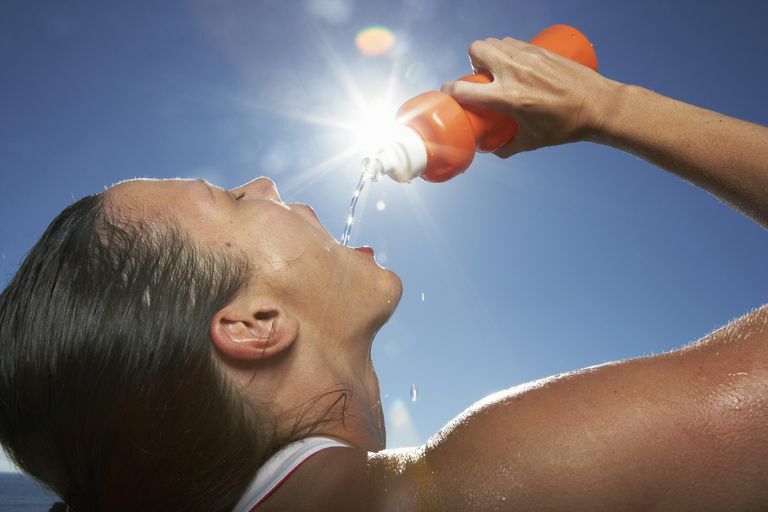 You can become dehydrated by sweating too much, by urinating too much, or by not absorbing water through illness. All of these must also be accompanied by not replenishing the lost fluid. In many cases, patients can correct dehydration simply by drinking water (see Treatment below). Dehydration is always caused by more fluid leaving the body than entering it. Water only leaves the body one of three ways: you can sweat it out, breathe it out or pee it out. Sweating can be from exercise, heat, or both. Some medications can make sweating worse. Breathing heavily during exercise or when short of breath for long periods of time pulls a remarkable amount of water out of the body. When you exercise, a lot of that water weight you thought you were sweating out is actually lost by breathing heavily. Excessive urination can lead to dehydration very quickly. Some of the most common causes of excessive urination are diuretic medications (water pills), alcohol and medical conditions such as high blood sugar (hyperglycemia, a condition seen in untreated diabetes). Vomiting and diarrhea are also common causes of dehydration. If you are vomiting or experiencing diarrhea, your body is not appropriately absorbing fluids. Dehydration symptoms in the elderly can be different than in younger adults and children. Medications that the elderly take are much more likely to lead to dehydration in that population. One particular symptom of dehydration that is more pronounced in the elderly is poor skin elasticity. When the skin is pinched, it holds its form rather than returning to its normal shape. The best cure for dehydration is prevention: stay hydrated. Get enough water through drinking and eating. Your total water intake for the day (all liquids and foods, including coffee, water, milk, soup, etc.) should be about half a gallon. Remember, some substances make you pee, which leads you to lose more water than you gain. Alcohol is the number one culprit for excessive urination. When dehydration gets bad enough to cause symptoms, water might not be enough to make you feel better. Dehydration occurs when the body has lost too much fluid and electrolytes (the salts potassium and sodium). Dehydration is particularly dangerous for children, who can die from it within a matter of days. Although water is extremely important in preventing dehydration, it does not contain electrolytes. To maintain electrolyte levels, you could have broth or soups, which contain sodium, and fruit juices, soft fruits, or vegetables, which contain potassium. Sports drinks, like Gatorade, can help restore electrolytes. For children, doctors often recommend a special rehydration solution that contains the nutrients they need. You can buy this solution in the grocery store without a prescription. Examples include Pedialyte, Ceralyte, and Infalyte. Untreated, dehydration may lead to shock. If a patient of dehydration has a low blood pressure or very rapid pulse, the victim may need to get intravenous fluids. Call 911 for a dehydrated victim suffering from confusion, dizziness, or weakness. Diggins KC. Treatment of mild to moderate dehydration in children with oral rehydration therapy. J Am Acad Nurse Pract. 2008 Aug;20(8):402-6. doi: 10.1111/j.1745-7599.2008.00338.x. Review. Hooper L, et al. Clinical symptoms, signs and tests for identification of impending and current water-loss dehydration in older people. Cochrane Database Syst Rev. 2015 Apr 30;(4):CD009647. doi: 10.1002/14651858.CD009647.pub2. Review.